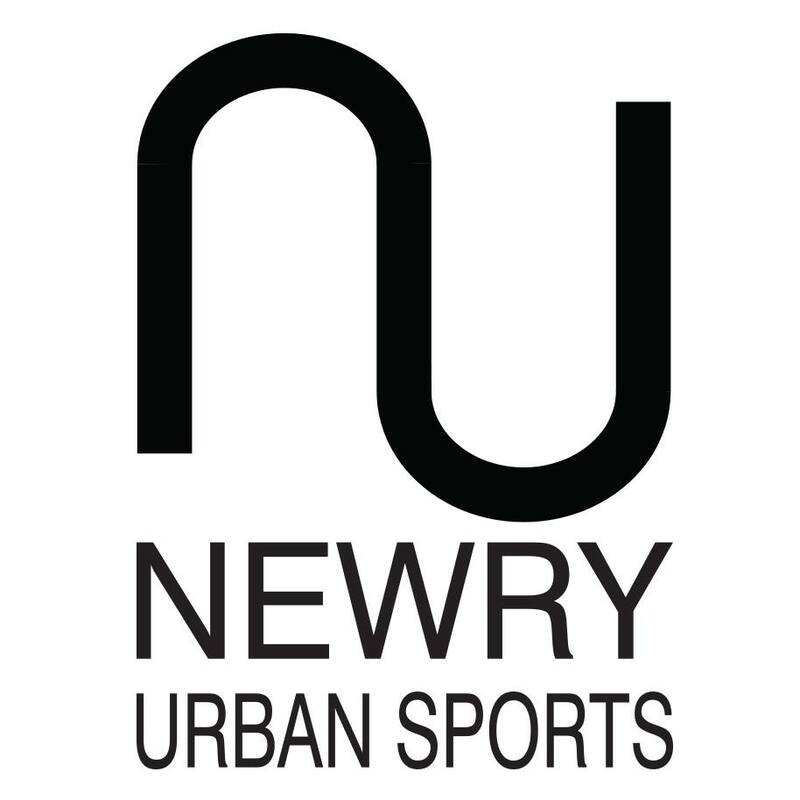 Founded in 2012 Newry Urban Sports is a group of skateboarders, rollerbladers and bmxers who are campaigning for a permanent concrete skatepark facility for the city of Newry. For the past two decades it hasn't been easy for people to enjoy these sports in Newry. With no facilities, these urban sports enthusiasts have been forced to take to the street to practice in a variety of public spaces throughout Newry & Mourne. This has not only annoyed local traders/public but has also left the local youth disenfranchised with the local government feeling that their leisure/creative desires are being ignored. Unlike other field and team sports, urban sports like skateboarding are collective and collaborative processes, where both boys and girls of all abilities and ages learn together, while encouraging and challenging each other to develop new skills. Skateboarding in particular, is a sport that focuses the mind, body and spirit in the pursuit of mastering skating moves and tricks. It is an exciting form of exercise that improves fitness, develops self discipline and increases confidence in young people. Skateboarders have created communities of mutual support around the world. Old skatepark in Kilkeel was removed by NMDC and replaced with a car park for the new swimming pool & leisure facilities. Local skateboarders were promised new facilities to compensate the removal of their existing park. Kilkeel skateboarders lobbied NMDC for their promised skatepark facilities. NMDC without appropriate consultation with local skateboarders bought large scale half-pipe skate ramps for a new skatepark. The project was then mothballed due to the insurance issue (the large, inappropriate scale of these ramps ment insurance costs were extremely high). This bought equipment now lies disused in the council yard to this day. 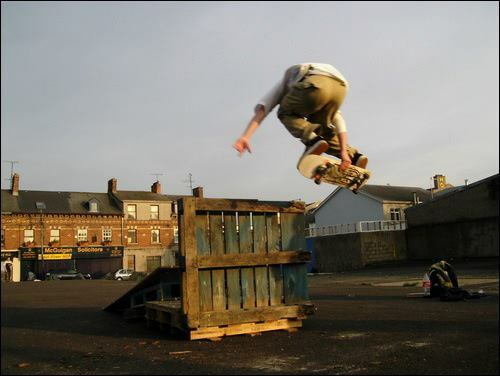 Skateboarders in Newry, Warrenpoint and Rostrevor set up constituted group called SRB (Skateboarders, Rollerbladers & BMXers). This Group begins lobbying NMDC for a new skatepark. Insurance was cited as a main blockage by the council. Crotlieve councillers meet with SRB and were given a presentation by the young skaters. The vast majority of councillors expressed supports for SRB's campaign. 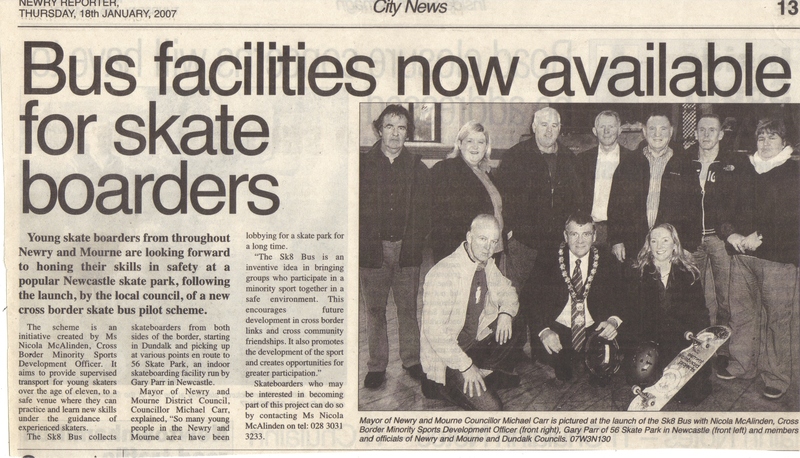 NMDC set up task force to help development of a skatepark in Newry & Mourne area. Corry Square was put forward as a possible site and was supported by the PSNI. NMDC agreed to hold a skate demo, this never happened. The task force recommends that part of Corry Square site be set aside for a skatepark. Consultations also are conducted with the public. Youth groups propose a skatepark within this development. The skatepark was rejected in the final plans. NMDC appoint minority sports officer. Part of their role is to develop skateboarding within the area. The Republic Of Ireland government announces a 2 million euro investment in developing 21 permanent public skateparks right across the country. Dundalk also recieves a skatepark facility. 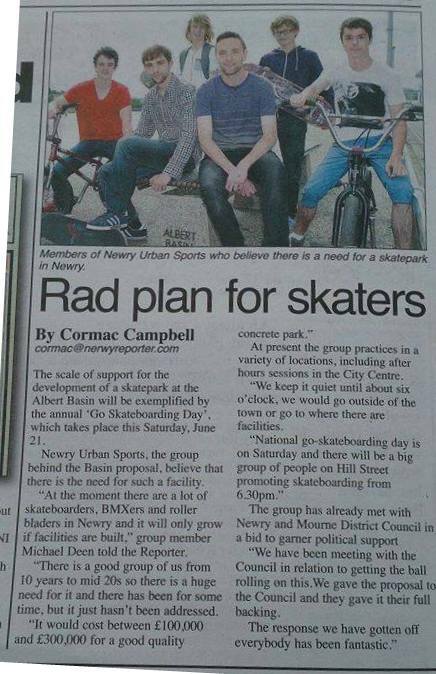 The minority sports officer organises cross border trips and a travelling tempoary skatepark for Newry for 3 days. Belfast Bridges skatepark is opened, Northern Irelands first public concrete skatepark opens. 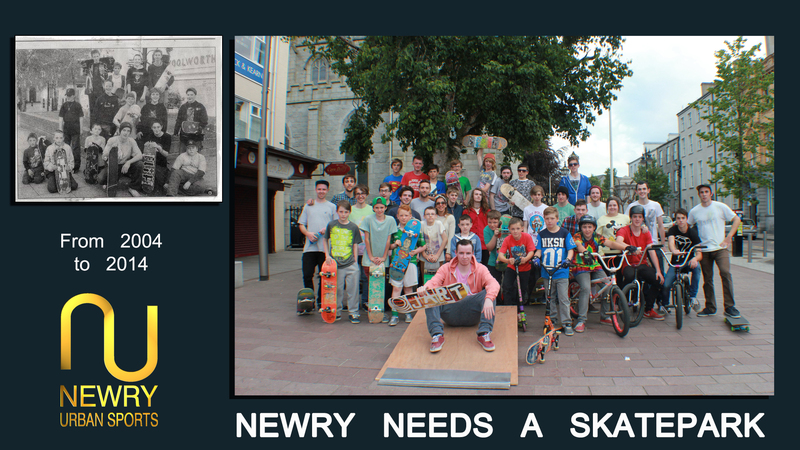 Newry Urban Sports is formed with its aim to get a skatepark in Newry. Northern Ireland's second public skatepark opens in Carrickfergus. Newrys first skateboard shop opens and the increase of kids starting to skateboard is staggering. Newry Urban Sports holds its first event on hill street with an incredible turnout.